Newzik, a MusicXML and PDF music reader, is on sale through Christmas for 50% off of its normal price (referral link). They are also including a collection of Holiday music to download for free. Now…the telling question: do I use Newzik? Not yet. While Newzik handles PDFs and is consistently improving its app, I still lean towards forScore and unrealBook on a daily basis. It is what I have used for the better part of eight years, and it is hard to leave a product until it can no longer do what you need it to do. Why would you want to purchase Newzik? 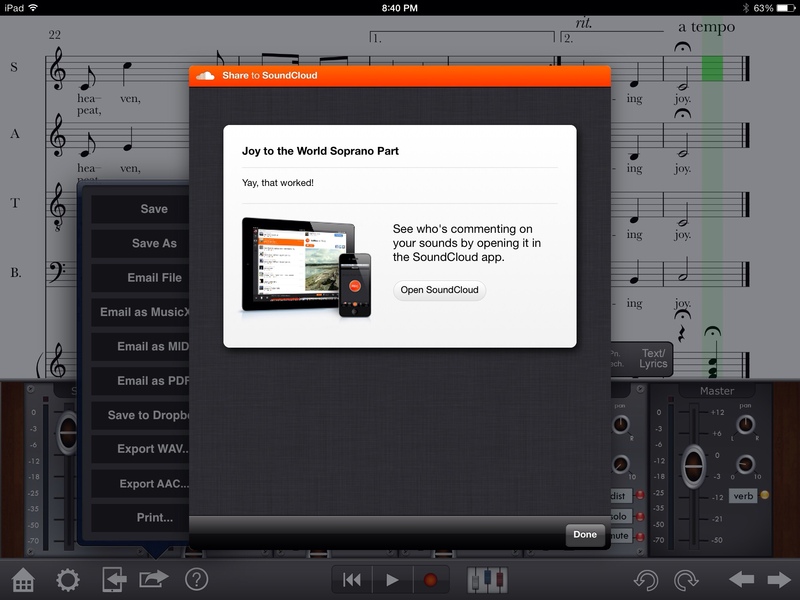 Ultimately, Newzik is the next generation of music reader for iPad (and likely all tablets). MusicXML is a better format for sharing music (as the MusicXML standard continues to improve) than PDF, because MusicXML file allows for changes in font size, choices of scores to see, embedded playback, transposition, and more. Publishers (generally) aren’t sending out MusicXML files, but I continue to hope that they will start to do so. 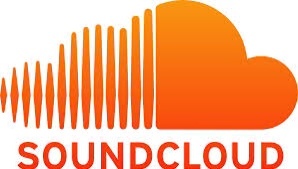 Additionally, Newzik is working hard to develop relationships with publishers and is pursuing new models to allow for the use of MusicXML files from publishers. And furthermore, music scanning only continues to improve (allowing you to make your own MusicXML files). Again…why do you want Newzik? Because it represents the future and what you are going to want to do with your music reading. And…it is on sale right now. Plus, you get free Holiday music. If forScore or unrealBook didn’t exist, I could easily use Newzik in their place. This is a great time to add this app to your collection. Are these posts helpful to you? If so, consider becoming a patron of techinmusiced.com at patreon.com/cjrphd. Today, NeoScores went live with their new digital music service. At its core, NeoScores is a HTML-5 based Music XML music reader that can work on any platform. The basic service gives you the ability to upload and use 25 scores; the paid version offers a number of additional tools. You can also upload PDF files to NeoScores, and NeoScores promises a service in the future that will convert PDF files to MusicXML format. I have uploaded both a MusicXML file and a PDF to NeoScores, and you know what? It works well. After the first “load,” scores load instantly and quickly. You given an annotation tool (mine appears olive green, and I need to see if I can change that setting) which translates across device to device; and of course, the real power is in MusicXML files that can be played back, parts turned off (e.g. A band director could give students a complete score, and have them turn on only their part), and more. Furthermore, you can zoom into a MusicXML file, customizing the size of the notes you can see. I have tried the new NeoScores website (this is all web based, but it works even without a wi-fi connection after songs are loaded) on my iPad, a Chromebook, my MacBook, and a Nexus 7 Android tablet. The music display works; annotation is less smooth on some platforms than others, and playback (an advanced paid option) has some issues (notes highlight as they play, but do not clear off the screen as pages are turned). You can see the potential, however, and if you use Chromebooks, you can rotate the screen (see my previous post about Chromebooks as music readers) and turn pages (quickly) left-to-right. The trick here is to get music into that MusicXML format. Again, NeoScores is promising a tool in the near future, but you can also use NotateMe/PhotoScore on iOS or Android; or PhotoScore or SmartScore on Mac/Win. I find that I can convert a standard choral score to MusicXML–with solfege written in–in about an hour. If you are new to the process, it can take significantly longer. You may also want to look at PDFtoMusic Pro (a new update is coming soon) that allows you to take a PDF file created by a notation software package and convert it to MusicXML. Truly, with all the hard-to-read scores on websites such as CPDL, the MusicXML files look better and offer more flexibility. Is it time to ask people to share all their scores in the MusicXML format as well as a printed format? If you haven't checked out NeoScores, do so today. I have written them asking for more information about use in schools–including the possibility of using GAFE accounts (Google login) to make accounts at NeoScores. SmartScore NoteReader is available…How does it compare? 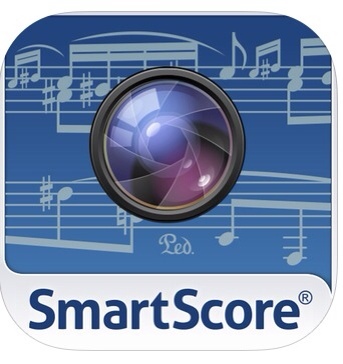 As I talked about scanning in my Technology in Music Education workshop yesterday, I noticed that SmartScore's NoteReader had been released on the App Store on the 15th. The app itself is free, but if you want to export any of the data, you have to pay $9.99 for the premium upgrade. SmartScore NoteReader is an app that allows you to scan and then play music (for free), and then (as an In-App Purchase) to export data a number of ways (including e-mail and Dropbox) so that you could import that data into SmartScore Pro X2 or any number of music notation programs, such as Finale, Sibelius, MuseScore, and Notion. SmartScore NoteReader allows you to take a picture(s) of a score, import a picture of a score, or import a PDF to recognize. In comparison, NotateMe's PhotoScore In-App Purchase allows you to take a picture (or a series of pictures) of a score, but importing a picture (on iOS) requires working through other apps, such as Mail. At the moment, NotateMe does not allow you to import a PDF. As a result, in terms of working with existing documents, NoteReader is easier to use than NotateMe/PhotoScore. I have only done a few scans with SmartScore's NoteReader so far, and initial trials indicate that NotateMe/PhotoScore is more accurate than NoteReader. 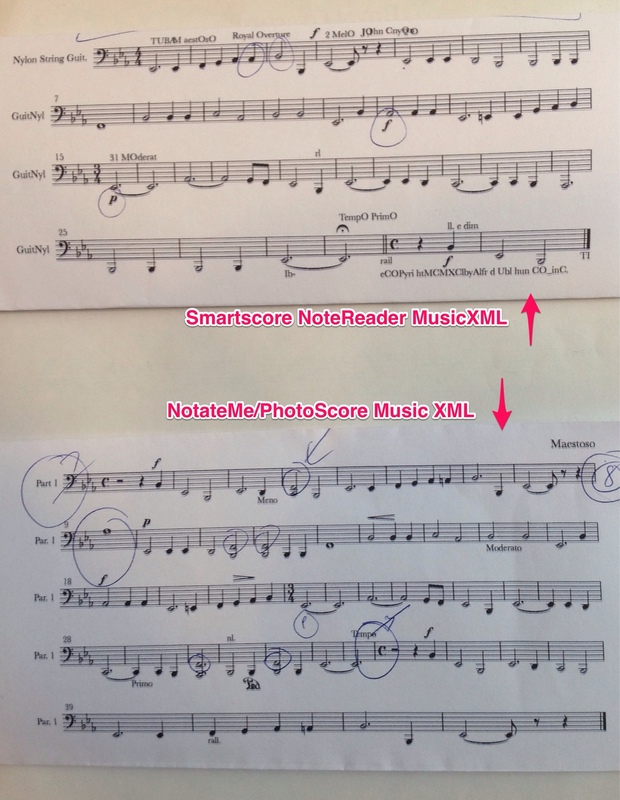 On a one part score, SmartScore's NoteReader scans with equivalent accuracy to NotateMe/PhotoScore–when all staves scan. NoteReader dropped staves that NotateMe/PhotoScore did not. PhotoScore also does a better job of handling lyrics–more lyrics are accuate than on NoteReader, although there are errors with lyrics on both apps. On a single line band score, I would estimate that NoteReader is scanning at 75% accuracy while NotateMe/PhotoScore is scanning at 95% (or greater) accuracy. In a multi-page choral score, NotateMe/PhotoScore stays at 95%, while NoteReader's accuracy diminishes greatly (50% or less). I am using the same set-up for scanning for both apps, with an iPad “document camera” stand and an iPad 4. It is possible that a closer photo could yield a more accurate “reading” from NoteReader; but I have noticed that NotateMe/PhotoScore tends to be a little more accurate when you don't zoom in very close to the page! Additionally, I would assume that the better the camera (in other words, with a newer device or an iPhone), the better the resulting accuracy of the scan. So, if you scanned with an iPhone 5S, you might have higher accuracy with both programs. Again, these are preliminary tests, and both apps are in their first weeks (or days) in the App Store. 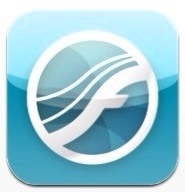 Undoubtedly, there will be app updates in the weeks, months, and years to come. It is exciting that you can scan music on your iPad (or iPhone, or Android) device without the need to purchase a scanner. In terms of accuracy, NotateMe ($39.99) plus the PhotoScore In-App Purchase ($29.99) is currently the winner, by a large margin (particulary when dealing with multiple parts). In addition to scanning, NotateMe also is a handwriting-based music notation app which allows you to edit those scans after they have been recognized by the software. NotateMe's ability to “Open In” feature is useful when exporting the data to another app (such as Notion). Both apps allow for the use of Dropbox. In terms of built-in useability (selecting existing images, using PDFs) and price, SmartScore's NoteReader (free, $9.99 In-App Purchase to export data) is ahead of its competitor. At 1/7 the price of the NotateMe/PhotoScore package ($69.98), NoteReader might be worth purchasing. And remember…both SmartScore and PhotoScore are very expensive desktop programs, each costing nearly three times the price if you were to buy both of these apps! And if you want to just TRY these apps, NotateMe does have a “lite” version called NotateMe Now (allowing for one score at a time) which DOES include PhotoScore, and SmartScore's NoteReader is a free app (until you want to export data). So…if you have an iPad, iPhone, or Android device (note: the camera on the iPad 2 and the original iPad Mini are not high resolution enough to work with some apps, such as NotateMe), at the very least download the free versions and see what these apps can do! 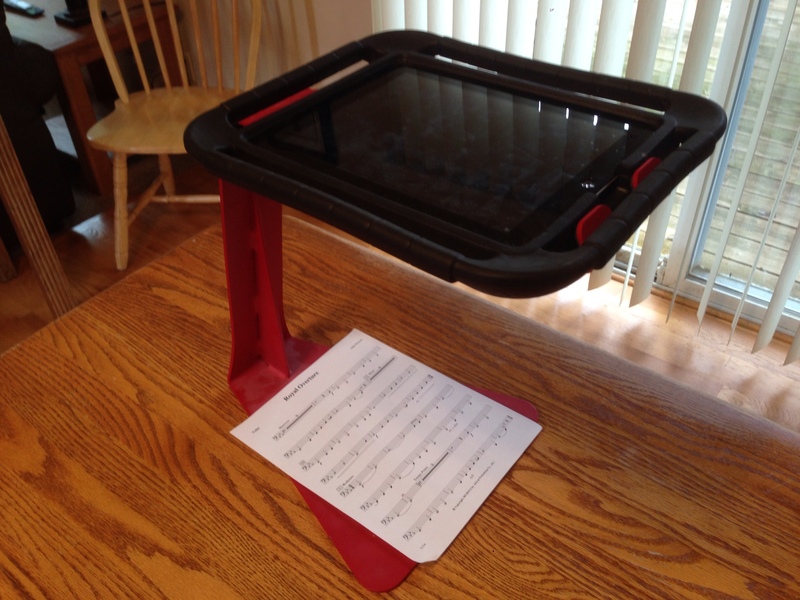 On Friday morning, Jeff Tillinghast wrote (On Choralnet) about using iPads in choir, when you have one iPad, five iPads, or every student has an iPad. I love his ideas–although I disagree with his statement that music is “too small” on the iPad (particularly with a reference to the Messiah–the famous G. Schirmer score is in the Public Domain [although it is still sold] and is larger on my iPad than it is in print). I've been doing this for years with a wide variety of technology. I am not a strong piano player. I've come to terms with this, as I am a very good tenor, tuba player, and conductor…and I have “mad skillz” with music technology. I've grown to accept that you simply can't be a master of everything. We, like most schools, use accompanists for concerts–and at my current school, we've been able to use students for every concert with one exception (our Mock Trial team made it to state, state was on the same night as our concert, and one of our piano players was in Mock Trial). For years I've placed accompaniment files into Finale, and generated rehearsal accompaniment files from Finale. When I enter all the vocal parts into Finale, I can make a rehearsal track for an individual voice part. As the years have progressed, I've added more data into those files (including text). Now, with SmartMusic, I can not only make an accompaniment for a student, I can also (quickly) make a SmartMusic assessment file at any point of the rehearsal process. In the “old” days, I would burn a CD for each section, and had students bring in CD boomboxes. For a period of two years, I had kids use Dell X5 Pocket PCs for sectionals with large iHome tubular speakers for sectionals. I have also used iPod Nanos and iPod Touches to achieve the same goal. Moving to iOS deviecs allowed for audio management with iTunes. Once you set an iOS device to import a specific playlist from iTunes, adding new files is as easy as dragging tunes to a playlist and syncing the iOS device. And now, with three iPads, we can start to do sectionals with iPads, and iPads make all the difference in the world. Not only can students control the music they hear, they can also see the actual music on the screen ! Again, special thanks to Chromatik, who donated an iPad to our program through their special offer. Let me walk you through the process. First, I scan the song my choir is preparing. Truth be told, all of our music is already scanned–something we did through most of 2010. Most of our scanning was done page by page on a flatbed scanner. These days I scan music using a Canon P-150 scanner, a scanner that scans in duplex and about 1/100 of the time. Using a guillotine paper cutter, I cut a choral octavo so all the pages are loose and can be scanned in page order. The P-150 automatically adjusts the width of the scan to the width of the page–no cropping necessary. All of these PDFs are saved on Dropbox (referral link–if you sign up, we both get a bonus) so I have access to all our scores at all times. Next, I take that scan and run it through a music recognition program–most frequently PhotoScore Ultimate. There are rare occasions where a piece doesn't scan well, but most of the time, the scan is 95-99% accurate. Then I export the PhotoScore file as a MusicXML file and move it to Finale, where I finish editing it. For an eight page octavo, it usually takes me an hour to clean up the score, move parts to a single line (most SAB scores put SA on the same line), remove dynamic markings, edit text (hyphenation is always messed up), and then recreate the Finale file from scratch and use the Clip feature in Finale to bring everything over. Third, and this is a new step, I export the file to MusicXML and save it to Dropbox. I open that MusicXML file in the Dropbox app, and tell my iPad to open it Notion for the iPad. In Notion, I adjust some small items (for example, tempo markings, as Notion doesn't recognize a rit or a fermata). Then, using Notion's new export audio feature, I can save m4a files directly to Dropbox, manipulating the audio output with Notion's embedded mixer board (very easy to create a track where one part is dominant). As a result, I am able to create a high quality compressed audio track that works on all iOS devices in my Dropbox account at one time. A moment of diversion: why not use Finale to generate these files? I used to do this, and it used to be my only option. If I do this on Finale, it requires more steps–and thus more time–to achieve the same goal. Additionally, the audio output of Finale is very low, meaning that I have to open up an audio editor such as Audacity to later increase the maximum volume of each track (this is true even when I have the base keystroke value set quite high, as well as Finale's mixer). I know MakeMusic is aware of the volume issue. And then, if I want to put the file on Dropbox, doing so from Finale requires a series of additional clicks. All that is a one-step process with Notion. So I use the programs in conjunction with each other. At this point, all of the resources are ready. I have a PDF of the score, audio files that include a part-dominant track for each part, as well as an accompaniment only (or all voices) version. All of these resources are on Dropbox. The next step is to put the resources on the school iPads. I have created a choir Dropbox account with a username and password I share with students. This means that only my students have access to these materials and I am not freely distributing them on the Internet. By sharing folders from my Dropbox account choir's Dropbox account, I can edit the contents of the folders on the choir's account by simply dragging items to my linked files on my personal account. So, if I have a women's choir folder on both accounts, I can drag a new file to that folder on my Dropbox account and it appears instantaneously in the choir account. It works like magic. This is where forScore (you could also use unrealBook) comes into the discussion. I download the PDFs of each song from forScore's Dropbox interface. 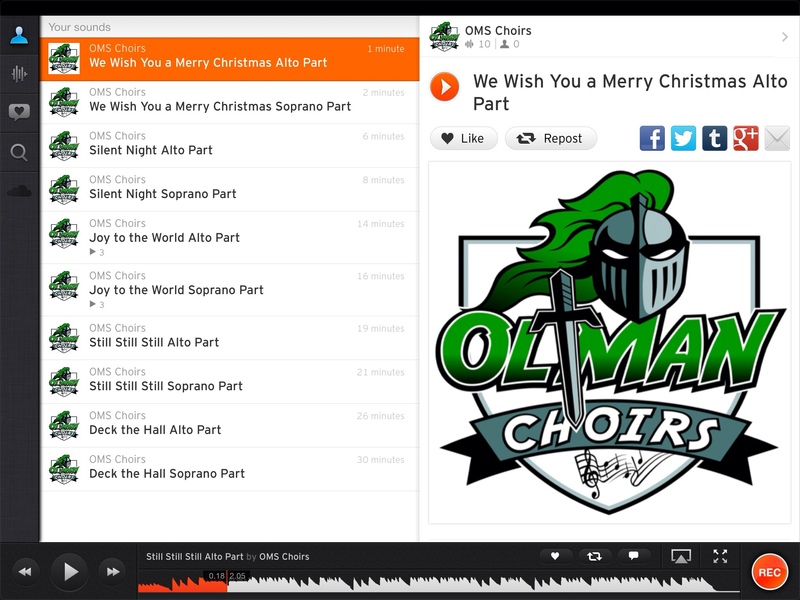 Then I use Dropbox to import the audio files to the computer that manages our iPads, and quickly add those files to the choir playlists (I have a playlist for each choir), and sync each iPad. At this point each PDF and each audio file is on our school iPads. Within forScore, you can quickly link a song to a score. In my prep period, I decide which section will rehearse during the day, and I quickly edit the audio that is linked to each PDF (e.g. If the sopranos are going to rehearse, I link the soprano track). During class, I send one section or two section to run sectionals, giving them specific expectations and a return time. They are given a portable speaker to use (usually a Boombucket (YouTube Video), but as I wrote yesterday, some Vers 2Qs are on their way). As a final step, I use iOS 6's “Guided Access Mode” to lock each iPad into forScore, and forScore alone. Students can put the devices to sleep, but cannot leave the program. In the days of using iPod Touches and iOS 4, students would take the devices and dink around with them during sectionals (going on Safari or playing with other apps)–Guided Access at least keeps them on task in the right program. I also show my students other tools with forScore, such as the pitch pipe or piano–I've had iPads returned with the piano “activated,” so I know those tools are being used, too. The truth is that my students don't ever see the time that is spent setting things up so that they can have a successful sectional without the need of a pianist–and that's okay. What is important is that this model works, and it works well. I'd certainly recommend it to others–even if you are going to record yourself playing (with an iPad?) in place of using Finale. My guess is that you will spend at least as much time recording and editing audio as it takes me to edit a score in Finale and export the audio through Notion for iPad. Two other quick thoughts about scanning music into a notation program. First, I'm having some students edit scans I've brought into PhotoScore with MuseScore this year–to see if they can learn how to use the program and to do the “clean up” for me (ultimately, making their own resources). I can bring those cleaned up files right into Finale. Second, any Finale file can be used to make a SmartMusic assessment, and I cannot possibly communicate enough how powerful and wonderful that is. Of course, SmartMusic's primary focus is instrumental music–but it works wonderfully for choir if you create your own resources. There are things that could be done by music publishers to make this entire process easier. They could make a PDF license for each song available, allowing you to legally reproduce as many PDFs for your program as you need. They could provide you with the MusicXML file for a song when you legally purchase it (removing dynamics, as I do, which makes it exponentially less useful for creating your own “performance copy”). And they could provide rehearsal tracks for free, like Carl Fischer/BriLee. 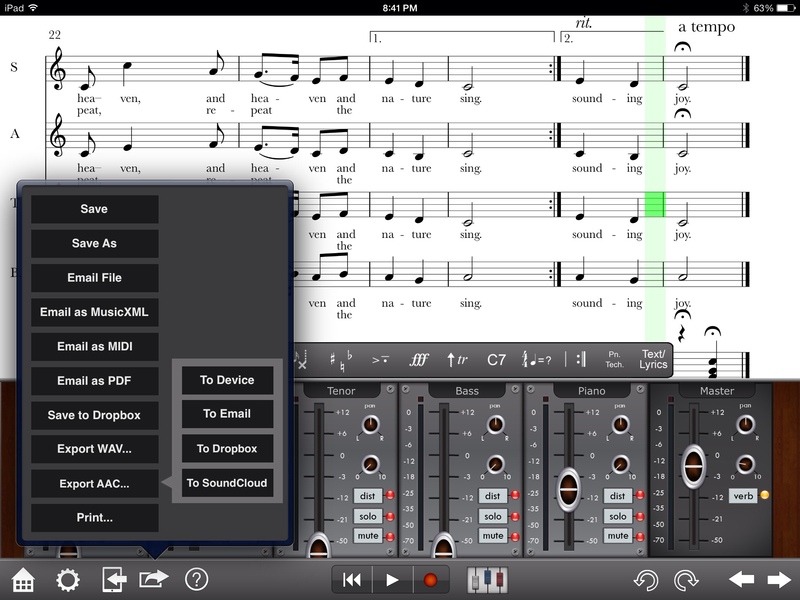 iPads–even 2-5 of them–can be a wonderful tool for your choir program. I'll make a point to write more about my iPad use in my teaching in the future. As with all “emerging” technologies–my use changes as the abilities of the device (more in regards to the abilities of the software) change and advance over time. If anyone is looking to make a donation to a high school choir program, we could use two more iPads and three more Vers 2Qs. I wanted to post a couple things about the free Finale player, Finale Songbook. Second, I'm using Finale Songbook for our musical rehearsals. The musical we are performing did not come with the option of a computer rehearsal score, so I've been putting all of the songs into Finale since August. We're about a month away from opening, and I've been able to create SmartMusic assignments for students having trouble with their parts (this show has several challenging quartets and quintets). I imported one of my scores into Finale Songbook and found out that the voice parts default to the choral “Ahh” sound, which I generally despise and normally set as a piano sound. So I've been taking all of these songs (26 not counting A, B, C, and other variants of some numbers–do a musical and you'll know what's I mean), saving them to Dropbox, renaming them (for ease of downloading), and then removing vocal tracks, leaving me with piano and sometimes rhythm. Although Finale Songbook doesn't have Dropbox capability (I wish it did), the musical staff and students can go to the Dropbox app, enter the choir's Dropbox general account info, and open any .MUS file to Finale Songbook. The result: instant rehearsal accompanist (particularly as our pianist is rehearsing most days with the pit band after school). I've been finding some glitches with Finale 2012 in the process (I'm using the latest version, 2012C), such the swing feature doesn't work correctly (an important part of the show), so you have to create a miscellaneous expression, create a Swing expression, assign the expression, and then assign it to all staves to get your song to swing. I'm also having to turn off all the “recorded data” (even though most things have been scanned and imported into a new document after editing) in order to get Finale 2012 or Finale Songbook to play the tempos I've added with expressions. Other than Dropbox integration, I'd love to see Finale Songbook add the ability to change the names of files (right now, these are based off the imported Finale file and cannot be changed), and to set the volume levels of each staff. I have had a few crashes of Finale Songbook (running on Beethoven, the choir's 3rd Generation iPad), with longer songs and with heavy use (including the deletion of files and reinstallation of files). I am able to use Finale 2012 to make quick edits (e.g. Set a tempo, add a note, add a cue line), save the file to Dropbox, open the file from the iPad (in the Dropbox app) and then open it back into Finale Songbook. Granted, creating a rehearsal track for a musical is a TON of work, even with scanning (again, I find PhotoScore Ultimate to be the most accurate software for scanning…saving as a MusicXML file), but in the end, we'll have a wonderful, consistent, customized (and customizable) rehearsal tool for the next four weeks until our show opens. You can't beat that. All this said, there might be some place for MakeMusic in the world of musical theater. It is definitely worth considering.